When man's best friend needs an afternoon at the park, Vet, groomer, or overnight at the dog sitters house, carry all of the dog treats in their personalized dog tote. Add an embroidered name on tote bag at the top of the dog paw. A perfect size for the dog's leash, pet food and favorite treats. NOTE... TOTE DOES NOT INCLUDES TOYS. 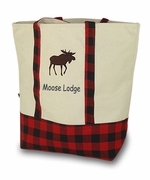 THIS TOTE CAN ALSO BE SILK-SCREEN CUSTOMIZED WITH A LOGO FOR GROUP OR ORGANIZATION. Features front slash and zippered pocket. Mesh water bottle holder and top grab handles. Zippered main compartment. Personalized dog tote measures 16" wide x 15" height and 5" wide.